Provincial Plank is a unique product that cherishes the natural, rustic characteristics of wood. Using carefully chosen hardwoods, we let the wood tell its own story with all its naturally occurring phenomenon like knots, grain swirls and colour variations. Character is the guiding criterion. 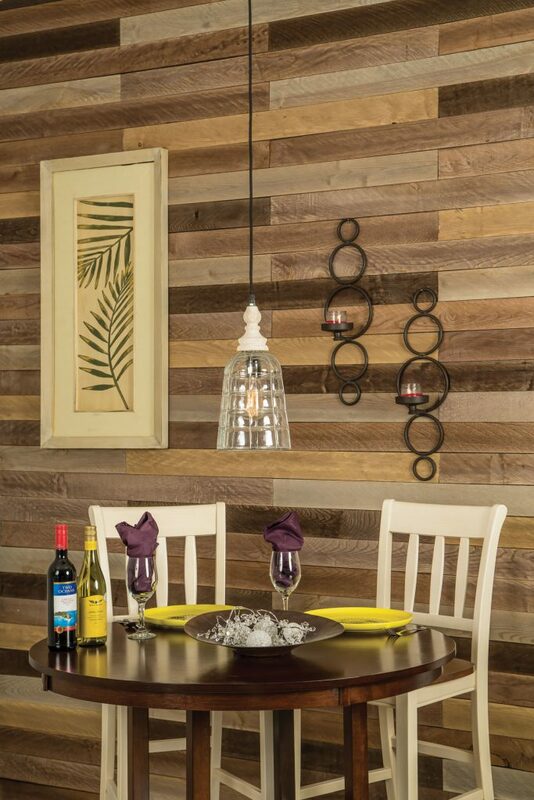 Made from 100 % solid hardwood, each slat measures 3/8” x 3-3/4” x 48” long. Each carton contains 8 pieces stained various colours. Both sides are stained so you get to pick the side that suites you. Plank wall installation is easy, simply paint your wall black and fasten the slats to the wall using glue or nails. The texture and thickness can vary slightly thereby giving the plank an antique, weathered appearance. With the knots and natural colour variation, the boards provide a rustic, elegant effect. Use Provincial Plank on one wall in your room, at the head of your bed. Or maybe in your dining room or behind a bar. How are plank walls installed?